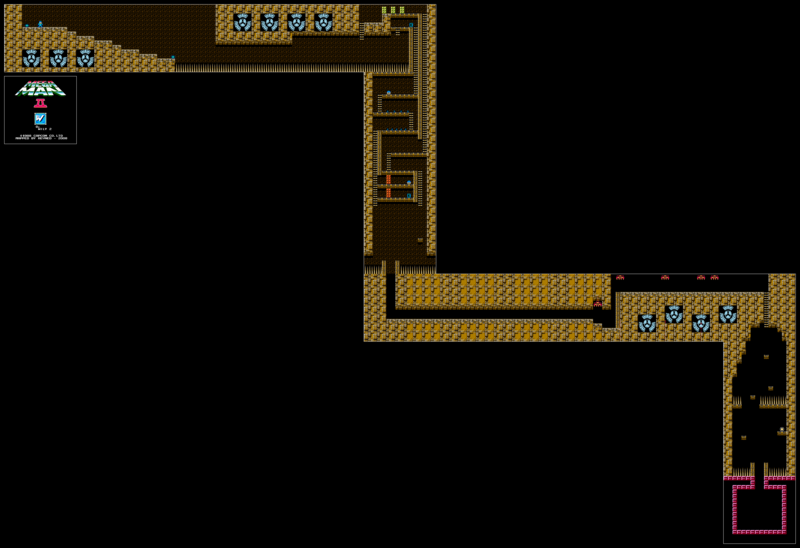 The map of Dr.Wily Stage 2. First up is a gauntlet of Flyboys, two large weapon energy refills, and a gap that can only be crossed with Item 2. This here is how you do required item segments well. The terrain starts close to the top of the screen, making the Flyboys harder since they're more likely to hit on the way down. If the free energy wasn't enough or the player didn't decide to refill Item 2, the Flyboys can be grinded for more very quickly. Best of all, aside from just forcing the player to use the item, this segment forces also them to deal with one of its drawbacks, since the Flyboys are likely to hit you during the starting delay if you don't time it right. The end offers a choice: grab the first ladder you see or ride a little longer for a hidden one. Though it isn't likely for the player to have used up their Crash Bombs by now, putting three walls on the main route was completely unnecessary. The other path offers a bunch of freebies, lets the player skip the Shotmen, and dumps them closer to the hole during the following drop. Falling into the room with the Shotmen from the right puts you in the path of their projectiles immediately, so the only way to avoid damage here is to climb down slowly. The tight corridor here makes dodging the Moles much more difficult than before, encouraging weapon use. Following is a forced Item 3 use (or a well-placed Item 1) and a few Presses, the last of which at least require more precision than usual (or the Time Stopper). After a couple more drops, we fall right into the boss room. Picopico-kun is something like a mix between the first game's Wily stage bosses, appearing as a series of enemies that are created from blocks that pop out of the walls. Two blocks move toward the middle of the screen from opposite sides, then combine. It will then alternate between moving toward you and stopping, with each one getting faster. They three hits from the Buster, Metal Blades, or Quick Boomerangs, but Bubble Lead can take it out in one shot. While the blocks appear in a set pattern, there's no way to anticipate where the next will be, and it can kill you in four hits. However, the blocks never appear from the same spot twice and you can see which ones have been used, so the latter half of the fight has some safe spots to stand. Overall, it's a good fight and offers Bubble Lead a chance to shine. Once again, the stage doesn't bother to do much of interest and instead focuses on forced weapon/item use. That first segment was pretty good, but the rest doesn't do anything that can compare to the quality of the main stages. This is the first time we've seen the multi-screen drop with spikes in this game, but Quick Man's stage already did something far more exciting with that concept. The color choice for the stage is pretty ugly too. I would have preferred the grey and teal scheme we saw on the way in.